With PA International, you have access to most advanced FPC facility in China. Start developing and prototyping in our R&D facility or manufacture if your design is fully developed. It’s not just our design and prototype-to-production manufacturing capacity that makes us different; our technical, engineering, procurement and customer services gives us a competitive advantage. Our R&D team developed custom solutions for most demanding applications including TESLA cars in USA and German auto makes. We are not just preferred but the only supplier to some companies. Do you need inventory schedualing for your flex or rigid-flex PCBs? Get pull and push inventory that meets your specific needs. Order in high volume, but let us manage your inventories with Just in Time deliveries. We also provide flex and rigid-flex PCB assembly services that reduces your vendor count, production delays, and quality issues. From single component to complicated box builds, we can do your component sourcing, assembly and testing. Fill in the form below and our engineer will contact you within 24 hours. We can help you with any Flex PCB assembly, engineering, design and manufacturing questions. 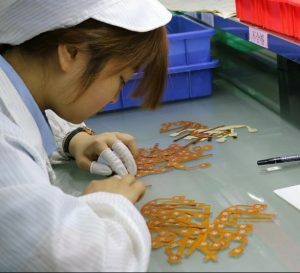 Been a China based manufacturer an important part of our business is short runs and small quantities of Flex PCB’s and assemblies. Copyrights © 2018. PA International.